"Fresh summer raspberries in raspberry jam on a buttery crust." In a medium bowl, blend together the flour, butter and sugar. Chill mixture for 1 hour. Pat chilled mixture into a 9 inch tart pan. Bake in preheated oven for 10 minutes. Once out of the oven, allow to cool. 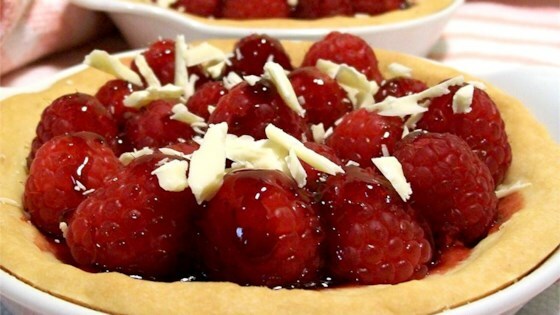 Arrange raspberries in crust. Heat jar of jam in microwave until it begins to boil. Pour jam over fruit. Cover and refrigerate tart for about 1 hour. This is awesome - although next time I would add a little cornstarch to the jam when it is heated. Would help the tart hold together when it's cut. This crust is great! Wow Wow Wow!!!! nedd I say anything else??? Very good and easy, too! Equally good with strawberries! I made this for a special occasion. Everyone loved it with real whip cream. I also put in individual tart pans. It was a hit.